Have you been looking for wisdom? Just last night I prayed for the Lord to give my family and me wisdom. Perhaps you’ve done the same a time or two. This morning I found out where wisdom likes to hang out. Not only was wisdom with God at the beginning of His way (Pr. 8:22), but she travels through righteousness, down the paths of justice. If we’re hoping that we’ll make the choices that will lead us to righteousness or justice, then wisdom is definitely the one we want to follow! She is going the way we need to go! She’s got the inside track on the hippest places to be. So, how do we find her in the first place? James 1:5 tells us that if any one of us lacks wisdom, we just have to ask God, who gives to us all generously and without finding fault, and He will give it to us. It’s easy. We ask for her. He gives her to us generously, and then we follow her. She calls aloud outside…raises her voice in the open squares. (Pr. 1:20) She cries out, and understanding lifts up her voice. (Pr. 8:1) I could go on and on, but God’s Word is full of wisdom. We ask God for wisdom. He gives it. We continue to follow it by continuing to stay in His Word and following what the wisdom of His Word tells us. The Holy Spirit continues to guide us in all wisdom and truth as we walk daily, and we just continue to follow…through righteousness…down the paths of justice. Oh man, as I’m reminded of all the scriptures about how wisdom pursues us, rewards us, and cries out for us, it makes me not just want to follow her…but to pursue her! You with me? You know what our Bible gives us? It gives a clear road map we can follow throughout our lives. No, the Bible doesn’t tell us if we should move to a different town, take that new job, or say no to that new offer. It does, however, give us very clear examples of the consequences of other people’s choices. The Bible has an example of every type of sin, with the cause and effect clearly laid out. The Bible has examples of faith, clearly showing the rewards that accompany it. Learning from the choices of others is very resourceful. We can save ourselves a lot of time by simply noting how the decisions of others affect their lives, their families, and their walk with God. Instead of being simple…walking straight into the wall we just watched someone else walk in to, we can can watch and learn how to be prudent (careful) by taking note and choosing differently. An understanding heart can clearly see that not only was David’s decision to commit adultery a sin, but it led to even more sins, a blemished relationship with God, and the death of his child. An understanding heart can see clearly that running from God, as Jonah did, only causes unnecessary troubles in our lives and delays the inevitable. Heb. 4:11 reminds us, “Let us therefore be diligent to enter that rest, lest anyone fall according to the same example of disobedience.” The Bible is full of examples from which we can learn. We just have to read it and trust God enough to fight the urges to make those same mistakes. We are also given examples of faith that can encourage us that trusting God will not end badly. An understanding heart can see clearly that Noah’s faith in God caused him to be not only favored by God, but caused his family to be saved from destruction. An understanding heart can clearly see that Rahab’s faith also caused her family to be saved. An understanding heart can note the provision that came when Moses’s faith allowed him to stretch out his hand over the Red Sea, believing that God would do what He said He would do. Provision also came to the widow who made a cake for Elijah with her last flour and oil, believing the Lord’s word that her flour and oil would last for her son and her until the rain came. Over and over, we can see how faith has produced results and sin has caused harm. There is so much we can learn in God’s Word. There is so much guidance for us all. All we have to do is read, and with our understanding hearts, learn prudence. Praise God for His Word that gives provision! There is a game I sometimes play on my iPad where I have to move pieces around. If I hesitate, the game will suggest a move for me. A few weeks ago I saw it lighting up a suggestion for me, but when I looked more carefully I saw a better move. It reminded me that not all suggestions are in our best interests. Even those from an expert. Daily, suggestions are lighting up all around us. We have to know our own end-game and make our decisions based on our own beliefs, convictions, and knowledge. God’s word gives us what we need. If we want our lives to lead to eternal life for us and for others, we must be careful with other suggestions…even from experts. Wisdom, which was possessed by the Lord at the beginning of His way, cries out to us. Like the suggestions on the game I play, wisdom lights up and suggests our next move. Unlike the game; however, which was created by humans, wisdom has counsel from the Creator of the world. Wisdom IS understanding and has strength. Wisdom hates the evil way and will lead us on the paths of righteousness and in the midst of the paths of justice. When it’s time to make a decision, and suggestions are lighting up all around us, we must take the time to look carefully and find the path that of righteousness that wisdom is suggesting. Blessed is the man who listens to wisdom. 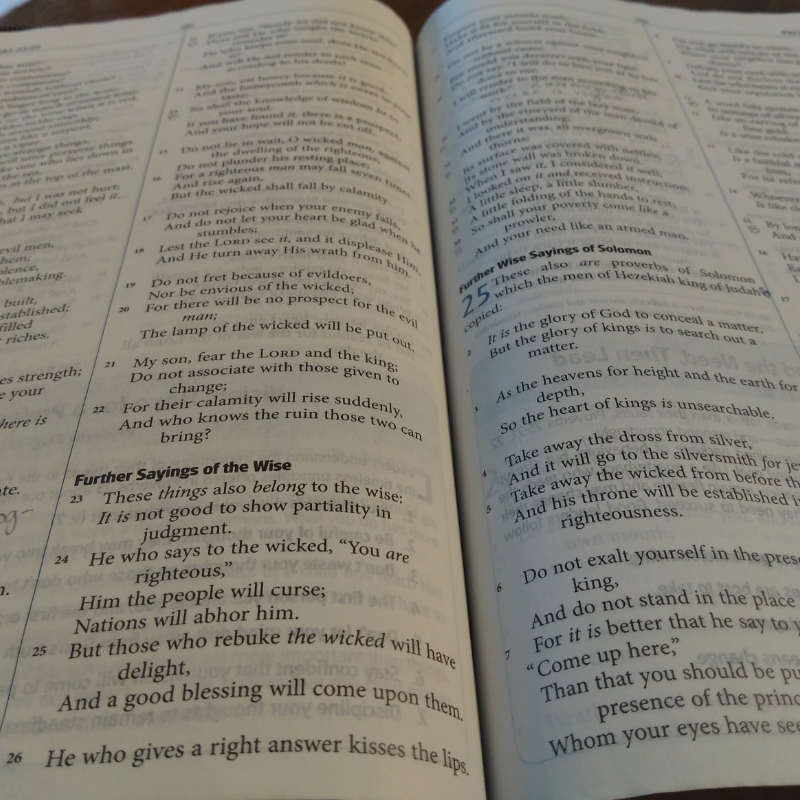 When is the last time you read Psalm 119? I encourage you to make time to read it this weekend. Give yourself 15 or 20 minutes…enough time to not have to rush through it. It is really quite beautiful and it is very inspiring. The author of Psalm 119 certainly did not disdain instruction, but embraced and delighted in it. I pray that this weekend, we would all long for the Word of God the way the writer of Psalm 119 did. I pray that the Lord would awaken within us a consuming desire for Him and for His Word unlike anything we’ve experienced before. Lord, like the author of this beautiful Psalm, help us to become devoted to fearing you. Oh, that our only hiding place would be in You. As those who have found great treasure, Lord, make us to rejoice in Your word. Great peace awaits us when our hearts stand in awe of Your Word. Open our ears, Lord, to truly hear You in Your word; and then let the wisdom saturate us so that we will not just be hearers of the words, Lord, but doers. Let us be engulfed in Your presence, oh God, and to touch others with the light of Your truth. All praise and honor and glory be to You, our King and our Lord! Do you remember when almost every plate of food you were served in a restaurant had a sprig of parsley on the side? It was not just added to make the plate look pretty and add some color. After your meal, you could chew on the parsley to freshen up your mouth and aid in digestion. This verse about wisdom reminds me of that parsley garnish. There are so many undesirable things that surround us, with which we can fill our mouths. We can choose to allow rank, sour, and noxious words to pour forth from our mouths, or we can choose to seek the wisdom and will of the Lord and freshen ourselves up. Wisdom has nothing crooked or perverse in its mouth. All the words of wisdom are fresh, pure, and excellent. But remember what Jesus said about what comes out of the mouth…it is what has been stored up in the heart. You must be intentionally storing wisdom, fear and love of the Lord, and a desire to do God’s will in order for your mouth to bring forth fresh words. How do you do that? Read and study God’s word. Delight yourself in Him and obey His precepts. Pray and spend time in the presence of the Lord. Allow yourself to submit to His will and the leading of the Holy Spirit. When you are so full of God that you cannot move without Him, the words that pour forth from your mouth will be refreshing springs of living waters that reach out to everyone around you. Don’t push aside wisdom, as many pushed aside their garnish. Savor and enjoy the wisdom of the Lord. Not only will it help you digest this life in a more satisfying way, but it will be pleasant and delightfully fragrant to those around you who need a breath of fresh air.